June 4th, 2018 was an unforgettable night! Many of you may ask, why was it so unforgettable? The answer is simple; it was the Cteen West Suffolk’s end of the year Dinner Banquet. Cteen West Suffolk holds an annual dinner to recognize all the volunteering we have done, plus the fun events we’ve experienced. Each year, several Cteeners receive recognition for going the extra mile and displaying special qualities. This year, the honorees were: Justin Winawer and Noah Rosenzweig (Chesed/Kindness award), Mikayla Shapiro and Justin Mintz (Rookies of the Year), Beth Goldberg (Dedication Award), Elijah Morrison (Teen of the Year), and myself (Leader of the Year). In attendance was Rabbi Sacks, Rabbi Tuvye Teldon, Rabbi Dovid and Mirel Weinbaum, Chad Lupinacci- Town of Huntington Supervisor, Susan Berland- Suffolk County Legislator, Carol Nuzzi, representing State Senator John Flanagan, and Jackie Gordon- Councilwoman from the town of Babylon. They warmly greeted us and presented certificates to the award recipients. We kicked off the evening with a delicious meal made by Limor Shapiro, while listening to the very talented Adam Aviram play beautiful keyboard music. Our MC’s for the night, Carly Tamer and Hannah Sharifian, welcomed everyone, explained the meaning of Cteen, and the highlights of the year. Next, Rabbi Tuvye Teldon recited a prayer in memory of the tragic school shootings that occurred this year. Listening to all the award recipients speak was truly inspiring. We were all moved by the joy they’ve received from Cteen, and how much their lives have changed because of it. I was amazed by every speaker that spoke proudly of how they have taken on a mitzvah over the course of this year. Some of these include wearing a kippah daily in public school, putting on tefillin, saying Modeh Ani daily, dressing Tznius (modestly), and going to shul each week. Elijah Morrison enthusiastically stated, “Cteen West Suffolk has given me a second home. A place to forget about the unimportant stuff in the world and come here to focus on changing the world one teen at a time.” We all went on to gratefully thank Rabbi Dovid, Ken Grotell and Leah for all their hard work and devotion to Cteen West Suffolk… Our chapter would not thrive without them. 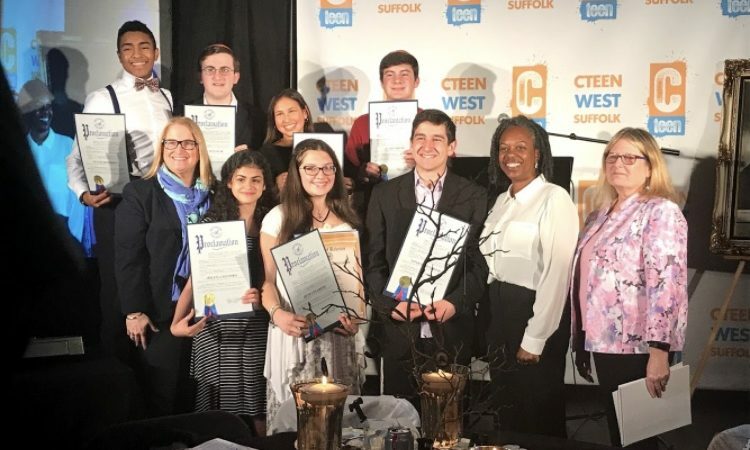 The annual Cteen West Suffolk awards dinner was not just an ordinary awards ceremony… It was a meaningful, heartfelt evening full of special moments all night long. It gave us a chance to exhibit our chapter’s dedication to Judaism, and wonderful events we’ve held this year. It inspired others to take on a mitzvah and do good for all. Importantly, it provided us with the bittersweet opportunity to wrap up the 2017-2018 Cteen year and motivate us for another incredible year to come! All About CTeen in D.C.!